All organizations need a “big picture” about the direction. Where they are going and the way to get there which involves strategy, strategic management and strategic planning. Strategy is a large scale action plan. It decides an organization’s direction. Strategic management involves managers from all sections of an organization devising, materializing strategies and strategic goals. Strategic planning involves setting the organization’s long term goals. It also includes the shaping ways to attain them. Strategic management and strategic planning are very important for an organization. As they offer direction and drive. It endorse new ideas and create a sustainable competitive advantage. Sustainable competitive advantage is achieved, when an organization succeeds in getting ahead and staying ahead in four aspects 1) in being open to customers, 2) in pioneering, 3) in quality and 4) in cogency. Strategic positioning strives to get sustainable competitive advantage by retaining organization’s exclusive features. Three main principles aid in maintaining strategic positioning. These are, 1) strategy creating a special and significant position, 2) strategy requiring give and take in competing, and 3) strategy creating a ‘fit’ among an organization’s activities. 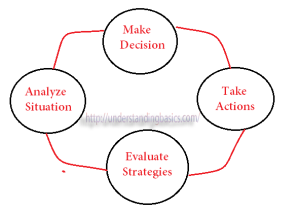 The strategic management process involves five steps and a feedback loop. Step 1 involves the setting up of a mission statement, which shows the organization’s aim and vision statement which explains the organization’s long-term direction and strategic aim. In step 2, the extensive mission and vision statements are converted into a grand strategy which elucidates the way to accomplish the organization’s mission. Step 3 involves strategy formulation, in which grand strategy is converted into more precise strategic plans, choosing the more suitable strategies among others and changing them to suit the organization’s needs. Step 4, the strategy implementation is actualization of strategic plans and step 5 is the checking of the implementation of the strategy and making improvements. If a problem arises, corrective action makes a feedback loop in which the managers return to the previous step and reassess policies, budgets, or personal statements. For developing the grand strategy, we need to gather data and make projections. For this purpose certain tools are required. First tool is competitive intelligence which involves gathering information about our competitors’ activities. The second tool is environmental scanning which requires watchful surveying of the organization’s internal and external environment to look for opportunities and threats. SWOT analysis is the method required for this scanning. Forecasting is third tool for devising grand strategy. It means formulating the vision or projection of the future. Trend analysis and contingency planning are two types of forecasting for strategic management. 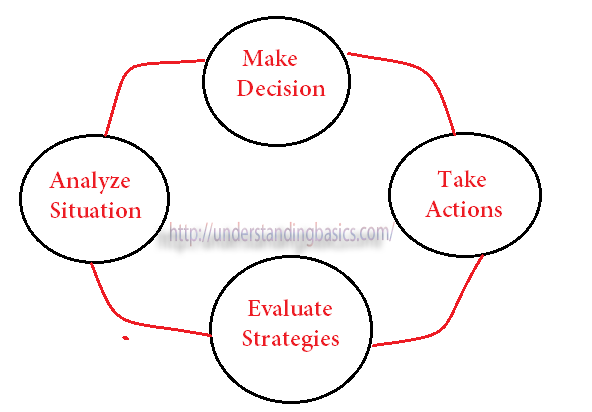 Strategy Formulation is the 3rd step in strategic management procedure. It utilizes multiple concepts like Poter’s five competitive forces; Poter’s four competitive strategies; diversification & synergy; and BCG matrix. Poter’s five competitive forces state that the company is faced with threats of new entrants; bargaining power of suppliers; bargaining power of buyers; threats of substitute products or services and rivalry among competitors. The Poter’s four competitive strategies are cost-leadership strategy, differentiation strategy, cost-focus strategy and focused-differentiation strategy. Diversification & synergy show the production policy of the company according to the market conditions for following a single-product strategy or diversification. The BCG matrix helps the management to determine and evaluate the success of business units on the basis of their growth and their share in the market. Implementing & Controlling Strategy are the last processes of strategic control. According to Larry Bossidy and Ram Charan execution is the center most part of the company’s strategy, it utilizes questioning, analysis, and follow through to interconnect reality with strategy to align individuals with the company’s goals and achieve targeted goals. The three core processes of execution involve people, strategy and operations. Through linking people with strategy and operational plans the execution helps the top strategic management to control the outcome in pursuit of strategic vision.